More than 1,5 million claims a year are received at the Spanish consumer affairs offices, around 100,000 divorce applications and other types of labor trials. Due to this fact, Burovoz is launched, the first communications certificate system which enables to record phone calls with full legal security, respecting the fundamental right to confidential communications. 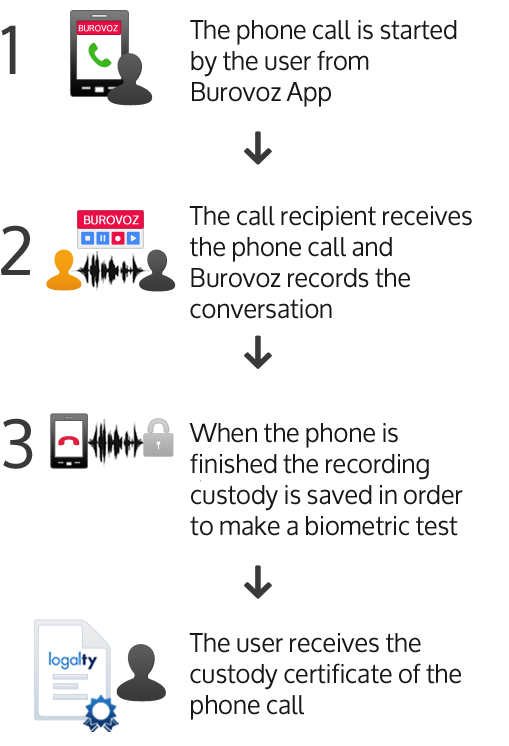 Burovoz is an application able to certify and Store made phone calls, as well as call attempts. Although it can be used from any telephone, it is much more comfortable and intuitive from a smartphone. The user only has to install the app in an iPhone or Android and register in the service. Once this is done, you can access your contacts through the app in order to record and certify all phone calls and call attempts from your mobile phone, if you wish so. The most relevant feature of Burovoz is its full legal validity. Logalty guarantees the conversation authenticity, as well as the integrity of it, respecting the fundamental right to communications confidentiality thanks to the evidence generation and custody process. Certified conversations by this system can be used as evidence in a trial or administrative process. Burovoz for companies is specially designed to solve the registration, recording, custody and certification of ongoing calls from the company extensions you may need. The service is configured using the corporate switchboard, and enables, transparently for the users, to redirect the calls towards our service with the same guarantees and features our service has in the mobile app. Or if you prefer, let us contact you.